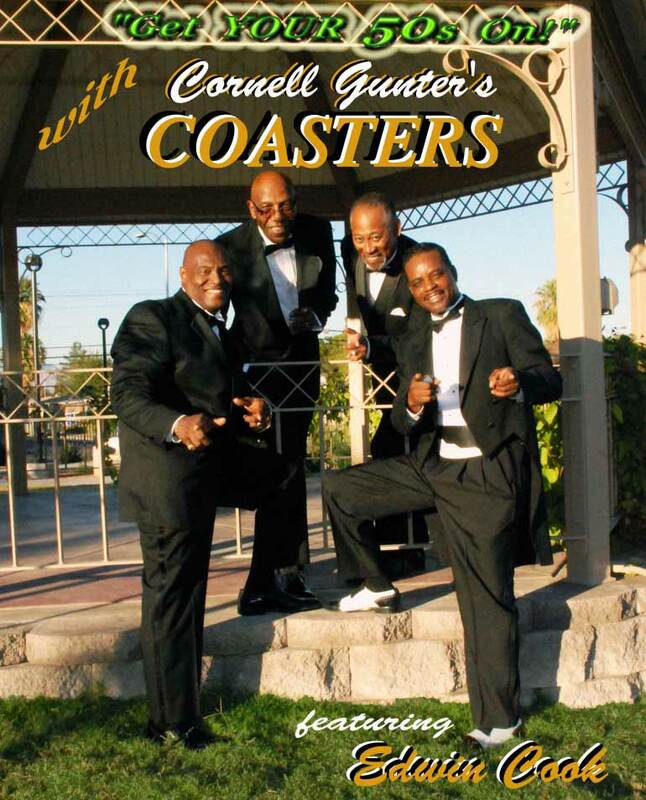 Edwin Cook, veteran member of Cornell Gunter's COASTERS, joined the group in January 1982 when member Teddy Harper succumbed to a fatal illness. 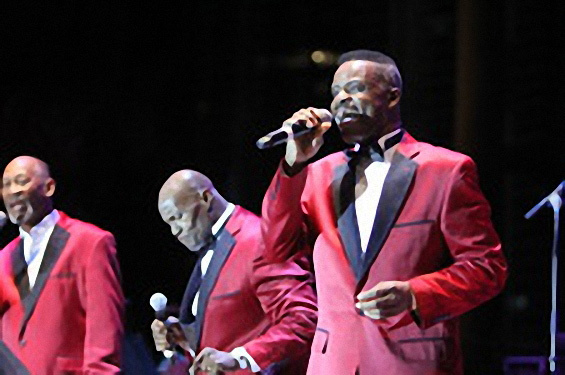 Teddy had handpicked Edwin to take his place and watched him make his debut with CGC in a joint concert with The Imperials at the Sands Hotel & Casino in Las Vegas, Nevada. 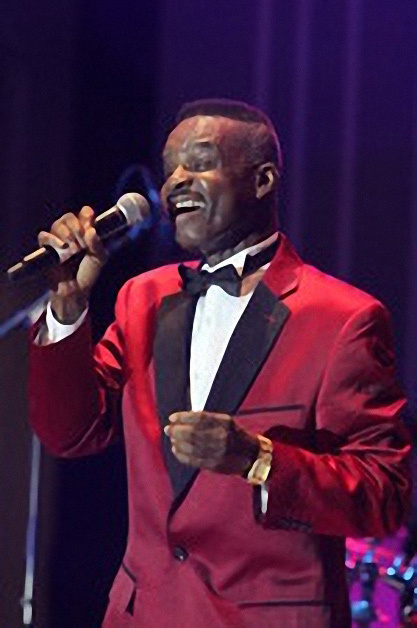 Edwin Cook was born in New Orleans, Louisiana and began his performance career at the age of eleven when he formed and toured with his first group, The Sunset Travelers, a gospel group. He also performed with the George Washington Carver Marching 100 in New Orleans, a very popular show band with the NFL's New Orleans Saints. Edwin initiated the twirling French Horns we became so familiar with during parades and halftime shows, looking like spinning balls of fire under the lights. In his teenage years, Edwin Cook sang with the Pro-Fascinations and began performing and competing in talent shows in New Orleans and surrounding areas. He tried unsuccessfully to convince his fellow members to move to Las Vegas with him, deciding to pursue music professionally. Upon arrival in Las Vegas, he was transported directly from an airplane to a rehearsal, then to a stage, where he began his Las Vegas career with The Monarchs. In the latter 1970s, word was out that the Buck Ram PLATTERS had a position open. Edwin Cook auditioned for Buck Ram...songwriter, producer, manager.. and was soon on his way for his first performance in Atlanta, Georgia, on his newfound stage. The BRP toured South Africa with Dobie Gray and Pipp Friedman, performing in Cape Town, Johannesburg, East London, Port Elizabeth and Durban, at the height of Apartheid. In South Africa, he was privileged to be part of history when the BRP broke through the color barrier, being the first group to perform there to a multi-racial audience. After several years with The Buck Ram PLATTERS, Edwin Cook took a break before joining Cornell Gunter and his COASTERS. The original Coasters...Carl Gardner, Cornell Gunter, Billy Guy, William "Dub" Jones...known as the Clown Princes of Rock & Roll, were the first inductees into the Rock & Roll Hall of Fame, January 1987. As a member of CGC, Edwin Cook has enjoyed performances all over the U.S.A., in Asia and Europe, including Germany, Ireland, and England, where they were privileged to play the London Palladium. When Cornell met his untimely death in 1990, Edwin Cook had performed with him for eight uninterrupted years. His four and one-half octave singing range made him the obvious choice to assume center stage as lead vocalist, while carrying on the legacy of the late, great Cornell Gunter and the Lieber & Stoller tunes Cornell helped to make so famous as lead tenor of The Coasters since 1957...Yakkety Yak, Charlie Brown, Little Egypt, Girls Girls Girls, Youngblood, and Poison Ivy, to name only a few. his career, and there are many more to come as he continues to weave his way through the business, expanding his career to take on new and different projects. In 2015 was the recording of “GRANNY’S GOT A TRAMP STAMP!” with Edwin Cook & The Company B Orchestra (Brenda’s group), lyrics by Matt Dorman, music composition and orchestration by Brenda Bouschard. She executive produced this project, as well, under her label Music Street USA and partnered with iTunes to promote their release on the global market. In 2016, he joined Brenda on another of her studio projects to record “Tahoe Moon,” originally intended for saxophone, written composition by Remmel Wilson, their longtime sax player for almost 8 years. Remmel was working on his third solo album when he chose to exit this life on June 11, one week after he was with Edwin and Brenda, recording “GRANNY...” on June 4, 2015. Never recorded before, Tahoe Moon lyrics were added, written by widow Beverly Wilson and Brenda, telling Remmel’s nice story. Edwin Cook joined Brenda to lay the vocals on this tune in close harmonic jazz styling. 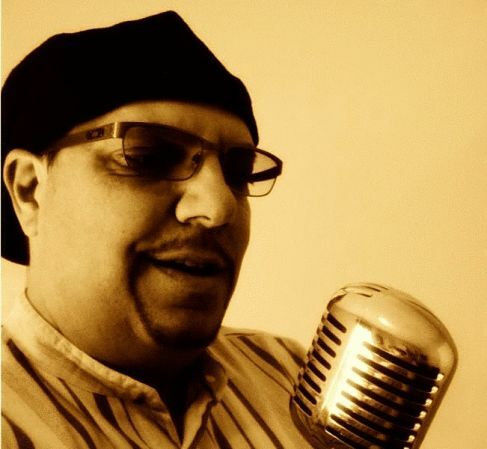 A Rock & Roll / R & B singer does jazz vocal stylings: A new stretch to his vocal cords and loving it! Week #48, 2017, November 27 - December 3, “GRANNY...” rose to the TOP 10 globally, among Indie Artists, achieving a new height of success for the Cook-Bouschard partnership. It’s too bad Remmel hasn’t enjoyed this success, as Brenda wrote the music, especially, to showcase Edwin’s and Remmel’s talents. Edwin Cook and Brenda have also created another version of their original show, titled "50s ALIVE," and debuted it on the concert stage in 2017. These moves seems to be a natural progression, considering his transformations over the years. hear a horn section in this new show? YOU BET! Still fifty percent shareholder of the name Cornell Gunter's COASTERS, per Federal District Court Judge Howard D. McKibben, who handed down his decision in June, 1993, this vibrant, energetic singer, musician, dancer, and comedian helps keep the legacy of Cornell Gunter's COASTERS alive, while he continues to grow and pursue new goals in his career as an entertainer. He’s a musician’s entertainer; he’s an entertainer’s entertainer, and “I can’t imagine doing anything else,” says Edwin Cook.